The American crow (Corvus brachyrhynchos) and the common raven (Corvus corax) are two highly intelligent black bird species with shiny feathers. It's easy to confuse the two, particularly if you're not observing them side by side. That they inhabit large sections of overlapping ranges adds to the possibility of misidentification. But distinct differences between the two exist. The most obvious difference between crows and ravens is size. Ravens are substantially larger, about the size of red-tailed hawks. Crows are about the same size as pigeons. Adult ravens average 40 ounces in weight, while crows weigh about half that. From head to tail, ravens are 24 to 27 inches in length; the smaller crows average 17 to 20 inches. In flight, the ravens' wingspans can reach 3 1/2 to 4 feet; crows' wingspans are about 2 1/2 to 3 feet. Also apparent in flight are the much longer necks of ravens relative to their bodies. If you can’t determine how large a bird you're watching is, other characteristics can provide a clue. If the tail is fan-shaped, you’re looking at a crow. The raven’s tail is wedge-shaped with a point at the end. Pointed wings with slotting between the feathers is typical of a raven, while a crow’s wings are blunt. A raven’s bill is larger relative to its body, and the top bill is curved. The crow’s bill is straighter and smaller. Neck feathers also differ – the crow’s neck is smooth, while the raven's neck appears ruffled and shaggy. Crows make a typical harsh and nasal “caw” sound in series, along with clicks and rattles. 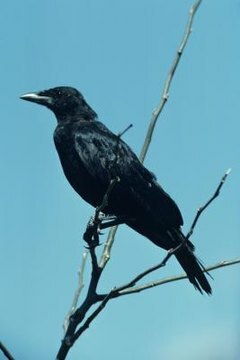 The raven’s call is a deeper, croaky “gronk” or “rok.” Crows are often seen in large groups and live in areas inhabited by humans, including farms, pastures and parks. Ravens aren’t as social; they are often seen alone or in pairs; they're more cautious of humans and live in more rural areas. Ravens soar more than crows and will often somersault in flight. Both species are highly intelligent and have been observed solving problems and using tools, such as rocks to smash shells on. The American crow inhabits almost the entire United States, with the exception of the desert habitats of parts of New Mexico, Texas, California and Arizona. Its range extends north into Canada into the Yukon, Northwest Territories and Quebec. Ravens inhabit the western United States, including Alaska, and almost all of Canada but are not common in the central or southeastern sections of the United States. The populations of both species are stable.